Keep your storage smelling fresh, with Fresh Scent Storage Boxes! 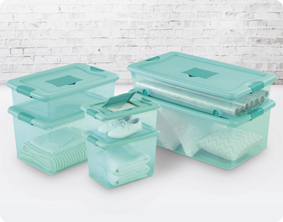 This unique product line is the ideal solution for seasonal or longer term storage, or when additional freshness is desired. 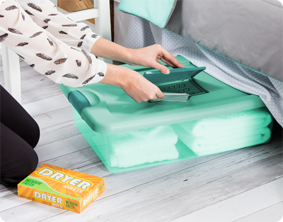 A standard dryer sheet fits in the lid’s innovative ventilation compartment where it works to eliminate unpleasant odors and ensure contents keep that “just-washed” scent. 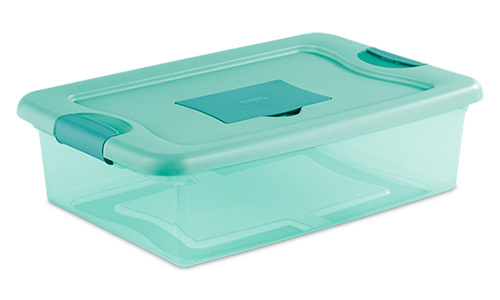 Fresh Scent Boxes have a modern space saving shape and feature a unique hinging lid. Simply undo one latch and lift the lid for easy access, all with one hand. The other latch stays attached and acts as a hinge, even when the lid is opened all of the way. The tinted bases and coordinated lid and latches give the Fresh Scent Boxes a refreshing appearance throughout the home. 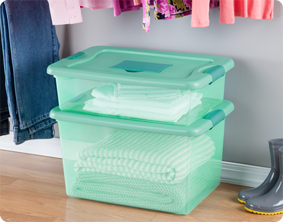 The 32 Qt Fresh Scent Box is ideal for clothing, towels and linens. The recessed lids allow same size storage boxes to stack neatly on top of each other to use vertical storage space efficiently. The 32 Qt and 64 Qt Latching Boxes use the same lid, allowing both the shallow and deep sizes to be stacked in same footprint. The overall assembled dimensions for this item are 23 3/4" x 16" x 13 1/2". Overall Assembled Size: 23 3/4" x 16" x 6 7/8"
The 32 Quart Fresh Scent Storage Box fits neatly under the bed – ideal for keeping extra linens and towels fresh and close at hand. 32 Qt Fresh Scent Storage Box is rated 4.9 out of 5 by 9. Rated 5 out of 5 by Gj32 from Great Idea! When I received Sterilite 32 quart fresh scent box,I just put some clothes in it and added a dryer sheet on the flip top part. My clothes smell not only fresh but clean,despite the clothes having already been worn at least once.I received this product as a part of a My-Take research study. Rated 5 out of 5 by betasp98 from Great Product I wasn't sure what to do with this storage box at first but then I decided it would be perfect for storing my pillowcases. It was easy to lift the lid to put in a dryer sheet. Now when I take my pillow cases out it adds a freshness to it. I could also see it being used to store my hats, gloves, and scarves because I only add use them for part of the year. The color was also great because it provides a pick me up from the traditional clear box. The teal color still allows you to see through it. "I received this product as part of a My-Take research study." Rated 5 out of 5 by Dictionary102 from Great concept that actually works I got this with the intention of storing unused yarn and I did for a few days. Then one evening in order to keep the shoes I'd worn all day away from my cats who like playing with them, fresh off my hot, probably stinky, feet, I decided to replace the yarn with the shoes. GREAT idea. Now I put shoes in at the end of each day and take them out the next morning either to wear again, or to store properly. The shoes don't smell and the cats haven't damaged them. I'd use the larger size for storing off-season items (hats, scarves, mittens, gloves, etc.) to keep them from pests and smelling fresh. Great product. I don't particularly love the color, or I'd have given it a 5 for appearance, too. "I received this product as part of a My-Take research study." Rated 5 out of 5 by blue4me from Great size We camp and leave a lot of items in our camper so that we don’t have to take things back and forth. I like storing clothing and linens in plastic containers when we’re gone for extended periods so that we don’t have problems with pests. I used this box to store my t-shirts, putting a dryer sheet in the compartment on the top to keep them smelling fresh. It did a great job allowing airflow to keep my t-shirt smelling like they just came out of the dryer. The lid is nice and secure and the clear box allows you see what’s inside while still adding color. I received this product as part of a My-Take research study. Rated 5 out of 5 by frankieheck2 from Nice Scented Clothes I used this box for all the small items I keep for my grandchildren such as socks and underwear and tee shirts. I was surprised how much fit in this handy small box. I like the fresh scent from inserting a dryer sheet. I received this product as part of a My-Take research study. Rated 5 out of 5 by kittenzzz from I really like this storage box! I have used the Sterilite 32-Qt. Fresh Scent Box for a few weeks now, and I really like it. I store my socks in it! There is plenty of room in it for all my socks; they are easy to find now; the box fits nicely into a large dresser drawer; and best of all, I keep a fresh dryer fabric softener sheet in the ventilation chamber in the lid, and my socks always smell freshly laundered. "I received this product as part of a My-Take research study." Rated 5 out of 5 by Monkeysad from A good way to keep linens fresh scented and secure! This is a great way to store cotton sheet sets smelling fresh and ready for use. 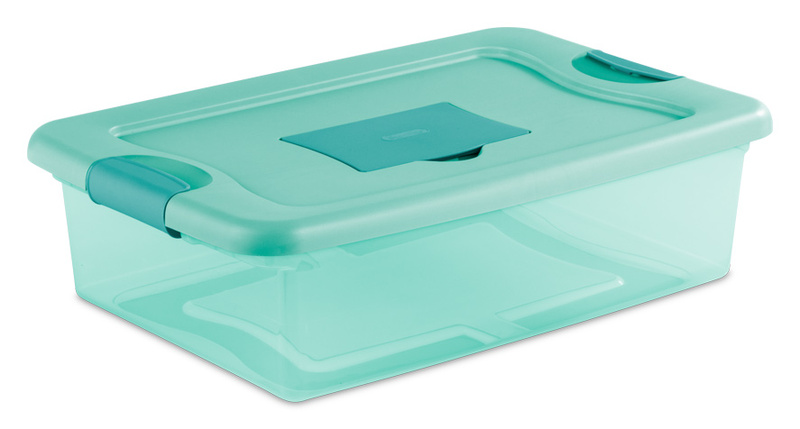 It is very durable with two locks on each end with a nice colored top but sides you can see through so a person can tell which set of sheets or any items you desire to keep in it. There is a compartment on top where you can lift to place a fabric softener sheet inside with internal air vents to get the fresh scent you desire. The 32 quart will hold a complete full size sheet set but is a little small for the microfiber sheets so would need to size up on those. I highly recommend this product because it keeps the items sage, organized for the next use and of course fresh as when you first wash them. "I received this product as a part of My-Take research study." but am glad I had the opportunity to find a great product! Highly recommend for sheet sets to stay organized!